Germany lost World War I. 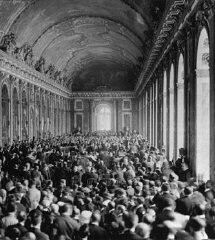 In the 1919 Treaty of Versailles, the victorious powers (the United States, Great Britain, France, and other allied states) imposed punitive territorial, military, and economic provisions on defeated Germany. In the west, Germany returned Alsace-Lorraine to France. It had been seized by Germany more than 40 years earlier. Further, Belgium received Eupen and Malmedy; the industrial Saar region was placed under the administration of the League of Nations for 15 years; and Denmark received Northern Schleswig. Finally, the Rhineland was demilitarized; that is, no German military forces or fortifications were permitted there. In the east, Poland received parts of West Prussia and Silesia from Germany. In addition, Czechoslovakia received the Hultschin district from Germany; the largely German city of Danzig became a free city under the protection of the League of Nations; and Memel, a small strip of territory in East Prussia along the Baltic Sea, was ultimately placed under Lithuanian control. Outside Europe, Germany lost all its colonies. In sum, Germany forfeited 13 percent of its European territory (more than 27,000 square miles) and one-tenth of its population (between 6.5 and 7 million people).